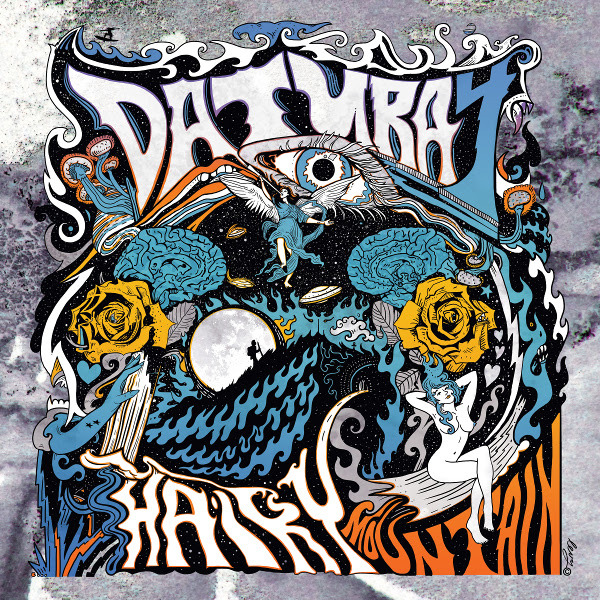 Hairy Mountain is the second release from West Australian band Datura 4. Continuing on from their debut album Demon Blues, Hairy Mountain presents 10 new garage-psych-blues rock songs. There are hints of early Black Sabbath, ZZ Top, and even David Bowie. There is even a nod to Muddy Waters in “Too Much (Or Not Enough)” where they grab the lyric “drinkin’ TNT, smokin’ dynamite” from his iconic “I’m Ready.” Most of the songs have pleasant psych-pop vocal harmonies in contrast to the aggressive riffing and fuzzed guitars. The songs are great from the nightmarish lyrics of “Trolls,” the rock-a-billy influenced “Mary Caroll Park,” to the slide and tremelo guitars on “Something to Hide.” Then we come to the excellent closing song “Broken Path,” which is a brand new direction for the band. This is first and foremost an acoustic guitar and bongos song with slide guitar playing glissandos up and down the guitar neck. “Broken Path” is so different from the rest, that I hope it is an indication of where they are moving musically. So if you enjoy good retro rock covering blues rock, psych, country rock, and a bit of rock-a-billy, then Hairy Mountain may be just for you.